The heart provides the body’s organs and tissues with a constant supply of blood – and with it vital oxygen and nutrients. You can think of the heart as a central pump that keeps the blood circulating around the body. At rest, an adult heart beats about 60 to 80 times a minute. Each time the heart beats it pumps blood through the body. When we exert ourselves physically, our heart beats faster. This increases the speed at which blood flows through our body. The blood can then absorb more oxygen from the lungs per minute in order to supply the body's cells with more oxygen. Your heart is about the same size as your fist and weighs around 300 g (about 0.7 pounds). In people who do endurance sports, it can weigh up to 500 g (about 1.1 pounds). The heart is located more or less in the middle of the chest, slightly to the left, behind the breastbone (sternum). You can normally feel someone’s heart beat if you put your hand on their chest. The heart is a hollow muscle. A wall through the middle (known as the septum) divides it into two halves. Each half has two chambers called the atrium and ventricle. The left ventricle pumps oxygen-rich blood out of the heart and into the body (systemic circulation) through an artery called the aorta. 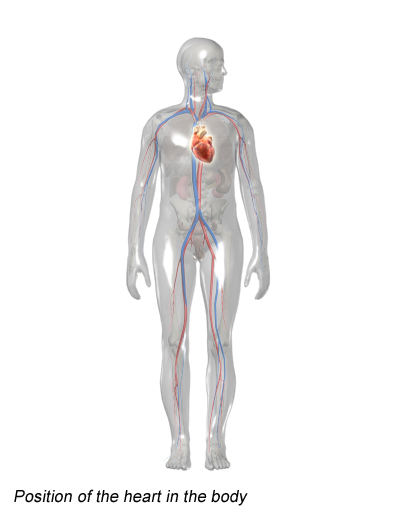 The first blood vessels that branch off from the aorta are the coronary arteries. They go straight to the muscle of the heart itself, and supply the heart with oxygen and nutrients. The blood that has been "used" by the body – and is then low in oxygen – flows back to the heart. More specifically, it enters the right atrium and from there it flows into the right ventricle. The right ventricle pumps the low-oxygen blood into the pulmonary artery, which leads to the lungs (pulmonary circulation). In the lungs, the blood releases carbon dioxide and picks up oxygen. Then it flows back to the heart through the pulmonary veins – this time to the left side of the heart. From there, the blood is pumped back into the body. 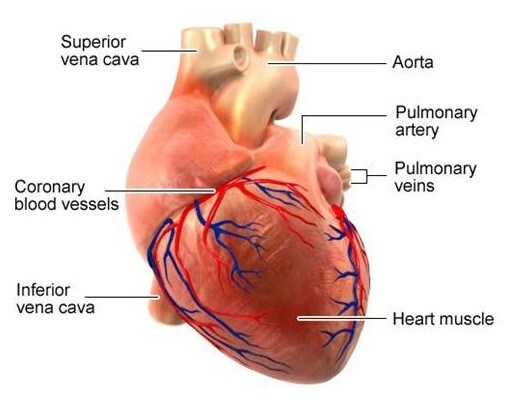 There are heart valves between the right atrium and right ventricle, the left atrium and left ventricle, and where the blood leaves the heart through the arteries. They ensure that the blood flows in the right direction and doesn't flow back. Put simply, the valves of the heart function like one-way gates. Each valve is made up of a ring to which two or three flaps of tissue (called cusps or leaflets) are attached. The flaps are always somewhat curved – a bit like sails billowing in the wind. When the blood pushes against these flaps in the direction of the "wind," they close the valve. When the blood pushes in the other direction, it is able to flow through the valve. The heart muscle is made up of special cells – the heart muscle cells – that contract rhythmically. An electrical "wiring system" is responsible for causing the heart to beat at all. Each heartbeat is triggered by an impulse that starts in the sinus node, which is a group of cells in the wall of the right atrium. Special pathways of nerves carry the electrical impulses to the muscle cells in the atria and ventricles, setting the pace of the heartbeat. Lippert H. Lehrbuch Anatomie. Munich: Urban und Fischer; 2017. Menche N (Ed). Biologie Anatomie Physiologie. Munich: Urban und Fischer; 2016.